Organic farming is a rapidly growing segment of U.S. agriculture. Organic vegetables, fruits, and livestock make up the bulk of the entire segment. However, a new USDA report shows organic field crops are making gains in the number of acres planted and overall value. 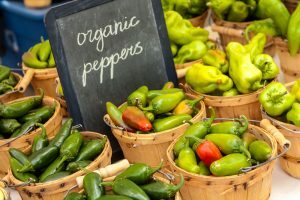 The National Ag Statistics Service released the numbers showing that U.S. farms and ranches produced $7.6 billion in certified organic commodities in 2016. That’s up 23 percent over the previous year. The number of certified organic farms also climbed 11 percent higher, coming in at 14,217 last year. The number of certified acres is up 15 percent to five million acres. Livestock marketed as organic can only consume feeds certified through the USDA’s organic program. That’s helping to drive organic production of corn, soybeans, and hay. The USDA report says about 7,400 farms planted 1.6 million acres of organic field crops and hay last year. The value of organic field crop sales totaled up to more than $762 million in 2016, more than $100 million dollars higher than in 2015. Organic corn had the most acres planted, totaling almost 214,000 acres last year.